Try as you might to take Foxygen's ...And Star Power at face value, it's hard to because the mischievous duo does everything but play it straight on the 82-minute double LP. 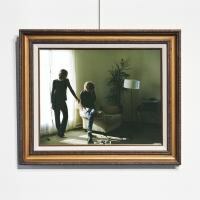 Try as you might to take Foxygen and its new effort ...And Star Power at face value, it's hard to do so because the tricksterish duo does just about everything except play it straight on its double LP. In Foxygen's own words from the press release announcing the album, Star Power refers to "a punk band"..."the radio station that you can hear only if you believe"..."a gaggle of guest stars"..."Roman-numeraled musical suites"...and more. Taking another crack at a descriptive account of it, …And Star Power is an 82-minute, 24-track, vaguely conceptual project, a collection of interesting retro sounds and conceits that often meander then disappear, bookended at the beginning and end by a handful of structured soft-rock songs. And while that's already a mouthful, these semi-literal takes on …And Star Power only scratch the surface of what actually transpires over the course of the sprawling work. A better way to put it might be that …And Star Power is the quintessential example of an album that either you get or don't get, sure to be one of the more divisive releases of 2014. On what amounts to a performance art experiment, the main pair of Sam France and Jonathan Rado aren't about to meet anyone halfway. In a cryptic interview with Pitchfork -- in which they claim that they asked Stevie Nicks and Paul McCartney to take guest turns -- Rado notes that the first side of the first disc is the one "casual Foxygen listeners will really like", the implication being that that audience might not enjoy the rest of the set, but that there are also those who believe and can hear the Star Power radio transmissions for what they are. Indeed, …And Star Power is an album that resists half-measures because there are so few entry points into it, pretty much demanding that you to soak in the total experience as is. Then again, it's hard to say that …And Star Power is any more comprehensible even if you're all in on it. While it has been called ambitious and indulgent in its scale and scope, …And Star Power might be better explained as an exercise in decadence, just according to its root meaning, as the music degenerates and devolves as the album goes on, rather than developing its themes or building up to anything. Sure, that first few of tracks should appeal to those casual Foxygen listeners, since the piano-rock of "How Can You Really" and the psychedelic musings and Kinks-y outro on "Cosmic Vibrations" are enough to get you to buy in, even though they're slighter than the best tracks on last year's breakthrough We Are the 21st Century Ambassadors of Peace & Magic. But if France and Rado could've gone further with the thread they start to unwind on "Coulda Been My Love", which brings to mind an easier-listening version of those devastating piano ballads from Big Star's Third/Sister Lovers, or expanded on the hushed, shadowy third Velvet Underground album vibe of "You & I", ...And Star Power would be a project worth upping your investment in. Instead, this is where …And Star Power quickly unravels, as it begins to break down less than a quarter of the way though with the aforementioned Roman-numeraled musical suites, "Star Power" parts I-IV. What makes the shift in composition and structure all the more frustrating is how Foxygen comes up with tantalizing doodles, but don't or can't or refuse to follow through and take them anywhere, like with the saloon piano part on " I", the guitar-rock chug of "II", the horn fanfare that opens "III", and the doo-wop vocals of "IV". Here, as a sign of what's to come, …And Star Power seems like an unruly rough draft, with Foxygen striking on its share of good ideas, but lacking the patience to revise and develop them or the discipline to focus on what's most compelling. There's a conundrum, though, in imagining how Foxygen would edit down ...And Star Power, because it would defeat the purpose of an album that, by its nature, is meant to test limits. Maybe …And Star Power loses you with that eponymous four-track passage, but it wouldn't be what it is without it or the yet more difficult middle section of the two-disc set. There, even the closest things to discrete, distinct songs during a long 45-minute stretch lack much shape and structure, like the Lou Reed-y stream-of-altered-consciousness ramble "I Don't Have Anything/The Gate" and the Elephant 6-like goof "Mattress Warehouse". ...And Star Power only gets even more formless after them, veering from mellowed out aimlessness ("Flowers" and "Cannibal Holocaust") to wack, spaced-out workouts ("Wally's Farm"), all interrupted and interspersed by distracting found-sound banter that's not far enough in the background. Yet even if you're willing to go with the flow to what ultimately functions like white noise, you can't passively listen to "Cold Winter/Freedom" when it actively gets under your skin, starting out to tooth-drilling, ear-ringing reverb and ending with absurd gibberish ("But now the Chinese are on the move / For the first time, letting their dogs die in space / A million dead dogs in space, in spaceships") delivered in a mock Malkmus-as-Mark E. Smith rant. If you're being generous, this stretch of …And Star Power is best described by the title of the next track, the similarly all-over-the-place "Can't Contextualize My Mind". If you're not, the album can seem to be about testing your patience just for the heck of it. When you do get to some of the semi-structured songs in the fourth quarter of ...Star Power, it's still hard to say Foxygen has regained its footing because the band never gave the album a chance to gain enough traction to begin with, nor seems all that interested in finding its bearings at this point either. The hushed acoustic-and-voice psych-folk piece "The Game" may feel like a welcome two-minute respite, but Foxygen immediately pulls any sense of stability out from under you by going back to the hijinks on the unfocused "Freedom II", a disjointed set of swaggering Stones-like moves without the hooks or heft to back them up and hold them together. Whether you're talking about aesthetic cohesion or something approaching genuine emotion, there's nothing to center and weigh down "Everyone Needs Love", an eclectic mix of sounds, ranging from EZ-listening soul to Bacharach-styled orch-pop, that may be executed in an intriguing enough way, but is still too manic to get you to feel very much. That's the heart of the problem with ...And Star Power that makes it so perplexing and exasperating: there's not enough substance and soul to it. While We Are the 21st Century Ambassadors of Peace & Magic could be off-the-wall (and let you know it), it was still able convey some intangible quality of greater consequence, whether it was the way the eclectic musical layers congealed or in a quirky poignance that gave Foxygen's eccentric sound its own sense of character. Granted, it's not easy to make any 82-minute, 24-track experience immersive and engaging all the way through, but the excesses of ...And Star Power yield lesser returns the longer it goes, because it gets more and more difficult to tell whether Foxygen's playfulness treats its '60s and '70s revivalism with good-spirited fun or as an above-it-all parody -- that, in turn, verges on self-parody for the group. For a project that's all about adding more and more dimensions to the Foxygen experience, something pretty basic but essential is missing here, the core of an identity for the band making the music.